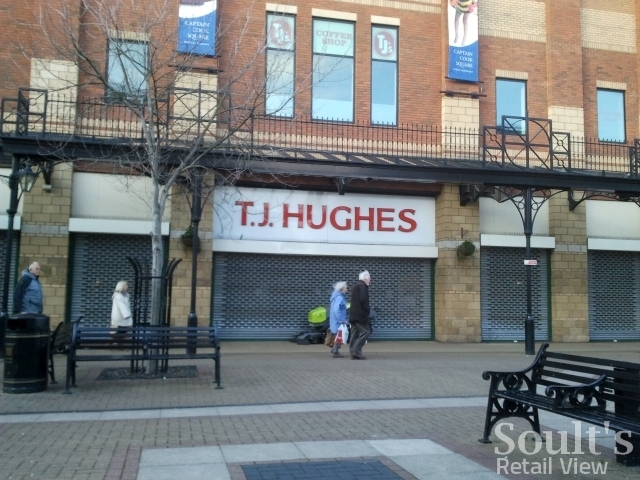 Middlesbrough had some retail good news on Saturday, as a new store opened its doors in the town’s former TJ Hughes premises – following on from the closure of the nearby Peacocks and Sony Centre stores earlier in the week. 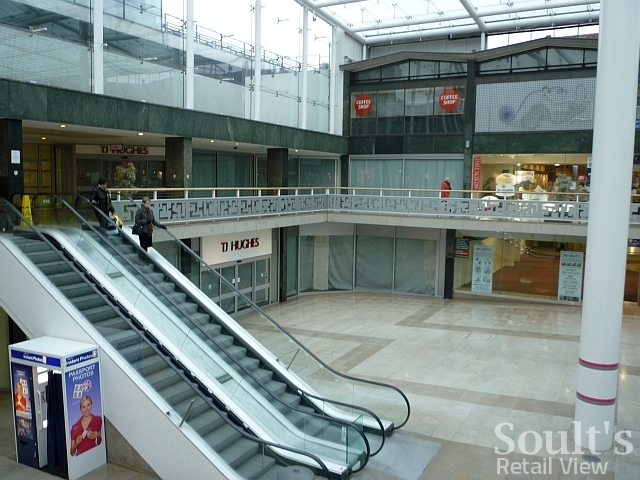 The 42,000 sq ft unit in the Captain Cook Square shopping centre – which had been vacant since TJ Hughes’ departure in August – has now been let to NUT Outlet Ltd, which has reopened it under its Metro Outlet fascia. 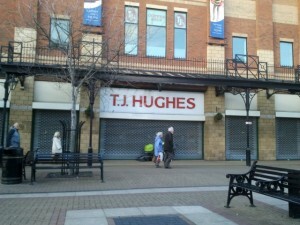 Fifty jobs have been created, half of which – including the store manager’s position – have gone to staff from the former TJ Hughes store. 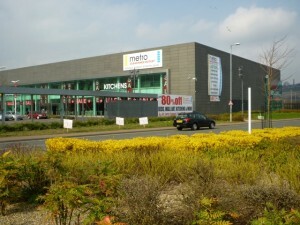 NUT already runs a 148,000 sq ft store at Metro Park West in Gateshead, which opened in November 2010 and specialises in furniture and homewares. 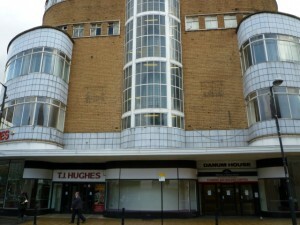 I understand that the Middlesbrough store will stock similar lines, but will also devote a quarter of its floorspace to fashions in an apparent move into TJ Hughes’ department store territory. 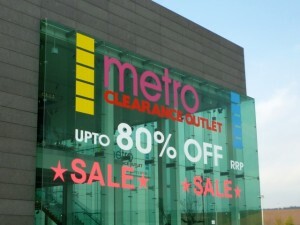 Fans of the popular TJ Hughes café in Middlesbrough will also be pleased to hear that Metro Outlet intends to reopen it, with an expected opening date of around 8 March. 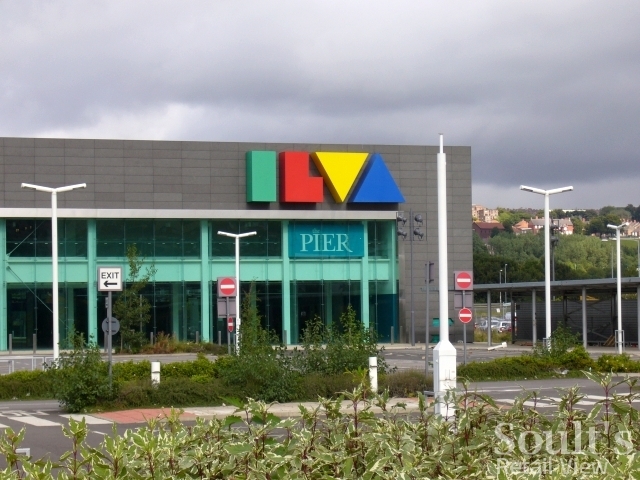 Metro Outlet’s existing Gateshead store is noteworthy in that it appears to be the only business able to make a go of the ill-fated unit that has so far housed both the Marks & Spencer Lifestore and the Danish furniture chain Ilva. 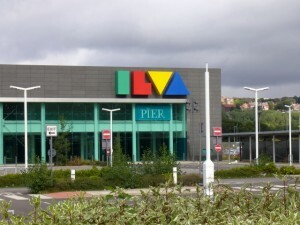 M&S announced the Lifestore’s closure less than five months after it had opened in February 2004, while Ilva barely managed two years in the UK before collapsing into administration in June 2008. 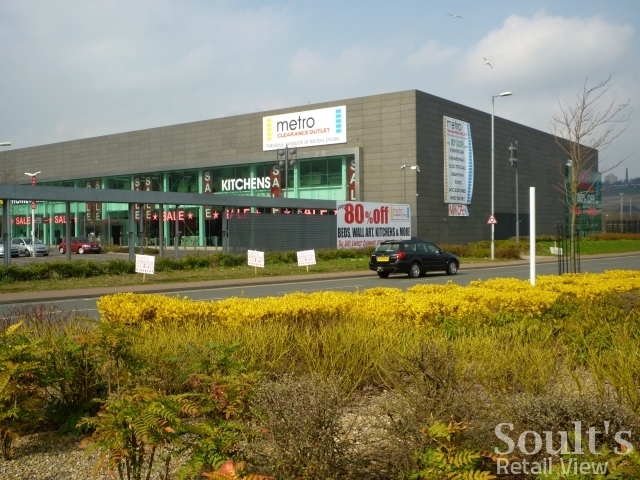 With Ilva having splashed out £8.4m revamping the premises on top of the £15m that M&S spent in the first place, Metro Outlet is probably the UK’s most luxuriously-housed discount store. Against such a striking building exterior, it’s perhaps not surprising that Metro’s rather garish signage and banners do seem slightly discordant. However, on the one occasion that I’ve entered the store so far I was impressed by the range and quality of the products on offer, my expectations perhaps unfairly lowered by the outside’s overbearing value message. Of course, the elegant interior that the store has inherited does no harm in upping the wow factor, and it will be interesting to see how the Metro Outlet offer works against the slightly less glamorous backdrop of a former TJ Hughes. It’s perhaps unsurprising that Middlesbrough has secured a new tenant for its ex-TJ Hughes relatively quickly, as Captain Cook Square is an attractive and well-connected scheme that has managed to maintain near 100% occupancy throughout the current economic downturn. Elsewhere in the country, however, the situation for former TJ’s sites has been less positive. 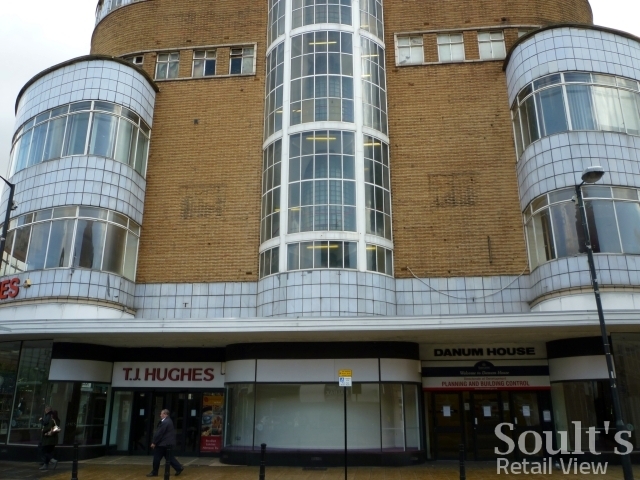 With a few exceptions, such as Debenhams moving into Dumfries and Poundstretcher to Ellesmere Port, most of the 51 sites left empty following TJ Hughes’ collapse are yet to find new long-term occupants. Indeed, just on my travels in the last few months it’s been hard to miss large and prominent empty TJ Hughes units in locations such as Bristol, Weston-super-Mare, Coventry, Nuneaton, Derby, Doncaster and Sunderland. However, given that the average TJ Hughes store occupied about 35,000 sq ft it’s not entirely surprising that the space is taking a while to be relet. 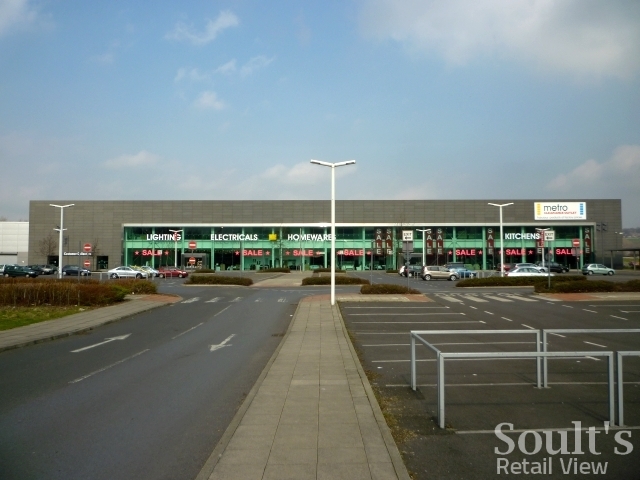 On the one hand, the size of these units – unless they’re subdivided – restricts their potential to a fairly small pool of expanding large-footprint retailers, such as Debenhams, Primark, Next and Wilkinson. Unfortunately, though, there are a dwindling number of towns and cities where these established chains aren’t already represented, or would want to be. On the other hand, newer entrants to the UK market – such as Forever 21 or Clas Ohlson – who might potentially be interested in one or two TJ Hughes locations, are taking a cautious approach to growth in the light of the challenging economic conditions and the need to establish their brands. 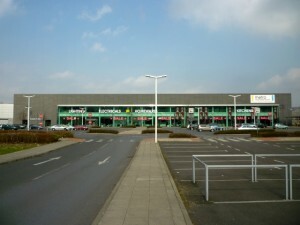 Even TK Maxx, which has been reliably growing for the last decade and a half, has temporarily put the brakes on UK expansion as it looks to reverse declining profitability, while the relaunched six-store-strong TJ Hughes chain has so far chosen to invest in its online store rather than acquire any more of the former shops. Instead, with Metro Outlet reportedly hoping to open two more stores during 2012, it could be that the best hope for other ex-TJ Hughes sites is a business launched and grown here in the North East. I went in the store the other day and they had some good stuff in, they had all the womans clothes at 50% off, one of the deals they were promoting is one were you can get a patio set, swing and 2 loungers for £199. When I got home I searched their name in google and they seem to be in the process of building a website. 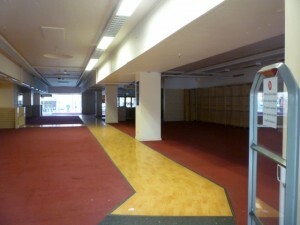 The store is getting better which is good for the people of Middlesbrough. I was delighted with the new garden furniture range at the new Metro outlet at mbro, I got a great deal on a patio set and loungers with first class service from the staff. 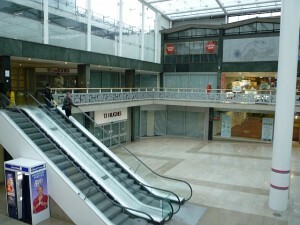 i often shop at the store at the metrocentre and i love that one! The Middlesbrough store is so disappointing! looks a complete mess! Far too many clothes on the rails and on the floors! Why on earth have the put the clothes beside the sofas?? I don’t want to be seen as slating the store as they do have some quality products in at good prices, but the staff at the new store don’t seem to be switched on, and having clothes beside sofas has no logic at all! Hopefully the store will see how the Gateshead branch is ran and follow in its foot steps. The store may seem disappointing now just because its just opened, but in my opinion, the Gateshead store is head and shoulders above this one. Had a look in there today, first impressions were they sold have decent 2 and 3 seater sofas for only £99, which in today’s climate is probably the cheapest you will ever buy one, a bargain really. Everything ok so far, then oh my god, not clothes next to furniture, and lots of them too, all crammed into the heavens and all over the floor, what a disaster!! To put it lightly, brought the image of the store right down from a half decent start. But to be honest the store aint that bad, they sell some really good quality furniture at very good prices. I am sure if they pushed the clothes to the rear of the store and brought all the nice furniture to the front of the store it would bear more fruit for them. With the really good quality furniture they have they could make the store look really stunning when you first enter it and would generate higher sales and margins for the business. If they dont believe me all they have to do is walk out of there front doors and around the town, there is hundreds of clothes shops in the town who have better value and set ups with clothes, why have odd item clothes at the front of your store mixed with furniture, crazy!!! Maybe the store will change when they get more stock in or when they realise its all going belly up. Went there, found it rather expensive! Escalator was working only UP, and not coming down. Toilets too were rather stinky. Everyone i saw in there a couple of days after it opened were rather bewildered as they where hoping it was going to replace tj hughes, (people where expecting a tj hughes replacement) but no, it’s more of a furniture shop, with expensive clothes and since mbro town has a big huge newly refurbished primark store, i don’t think Metro Outlet will do very well at all. Thanks Soph! I’m in Middlesbrough briefly next week, so will try to take a look. If it’s anything like the Gateshead Metro Outlet, it will probably take a bit of time to get fully stocked, and for the cafe to be operational. Not making a good impression in these very early days still isn’t a great idea, though.